To help you get started creating your own Contextual Tabs, I’ve recorded a quick video showing you how it’s done. In the video I show you how to create a new Contextual Tab for Multileaders. 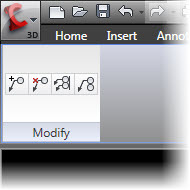 Afterwards, when I select a Multileader, AutoCAD loads a Contextual Ribbon Tab that I built with the tools I use most when working with Multileaders.